a letter by the editorin-chief of ACHE to readers of the magazine. interview with twentyyear-old photographer valerie chiang, who lives between raleigh and los angeles. meet gloria marigo, an italian fashion and beauty photographer with a taste for soft tones and film. agnieszka chabros aggie chabros is a melbourne-based fashion photographer and our cover photographer for this issue. a column by three students at nyu: jacqueline harriet, jessie roth, and sandy honig. martijn berk is a photographer from amsterdam, the netherlands, with a passion for creating short films. magdalena lutek is a twenty-seven-year-old polish photographer with an affinity for nature and quiet. an editorial with sara skinner by editor-inchief jackie luo, with styling by jessica kay keller and hair and makeup by alice li. we spoke with twentyone-year-old lindsey lugrin, freelance model for photographers such as tamara lichtenstein and hana haley. an editorial by irina slipchenko, featuring models ulya @ new face and sasha @ star system. an editorial by mili malinovic, featuring models martina krot and silvia soldo. tyler varsell is a twentythree-year-old collage and mixed media artist in goshen, connecticut. three short pieces by stefan yambao, twentyyear-old from ann arbor, michigan. welcome to issue #7 of ACHE magazine. in this issue of ACHE, we celebrate change. people grow and evolve, and while change can be terrifying, painful, heartbreaking, it can also be beautiful. after all, that’s why ACHE is here—to embody the longing, the yearning, for that remote, faraway something that could be or may never be again. change can be pivotal, disastrous, or refreshing, but, more than anything, it is illuminating. it’s what you make of it. in that spirit, we call upon you, readers, to make this year your best yet. 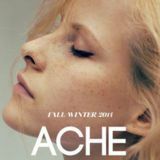 as always, ACHE is looking for submissions from artists, designers, photographers, writers, bloggers, musicians, and more. we’re open to adding writers, photographers, and editors to our staff, so let us see samples of your work! to submit, send us your full name, age, city and state/country, and any other information we might need, along with your work. 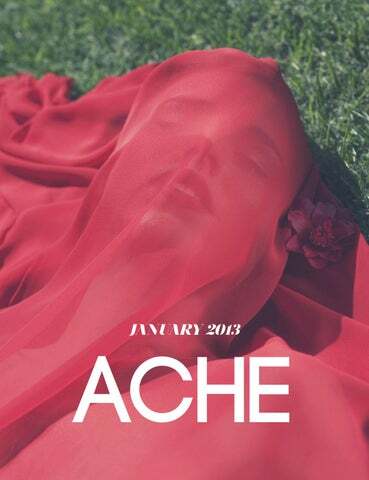 weareachemagazine@gmail.com keep living young, keep making art, and keep reading ACHE. VALERIE CHIANG valerie is a twenty-year-old photographer living in raleigh, north carolina, and los angeles. sheâ&#x20AC;&#x2122;s been taking photographs for about three years, and eventually hopes to go on a road trip across the country with her dog. valerie attends the university of southern california as a film production major. ACHE Magazine: Why do you photograph? Valerie Chiang: I photograph because I love making art. I’m not going to pretend that if I didn’t photograph, I wouldn’t be able to live. It’s just my chosen form of creative outlet. I’ve also recently started making collages, and I draw pictures every now and then. AM: How long have you been shooting? How has your photography changed since you started? VC: I’ve been shooting for about three years now; I believe I started taking photography seriously when I was seventeen. When I first started, I wanted to portray this fantasy world in my images, this utopia. I still do, but I am now more attracted to realism. It’s interesting that you asked me this question because I’m struggling with this right now. I feel as though the fantasy stage of my work hasn’t quite ended, and yet I haven’t been able to fully capture the essence of the raw portraits and documentary work that inspire me. I believe what I want to do right now is perfect, this balance between realism and surrealism. AM: How would you describe yourself as a person and as a photographer? VC: I’m a nostalgic person, and that constant state of longing forms the undertone to my work. I’m not shy, but some people would say that I’m quiet. I like being alone most of the time; I love being by myself—it’s hard for me to get lonely. I think this influences me as an artist; I have a lot of time to think, muse, whatever. As one of my favorite photographs/filmmakers, Wim Wenders (Wings of Desire, Buena Vista Social Club, and Paris, Texas) put it, “solitude and taking photographs are connected in an important way. If you aren’t alone, you can never acquire this way of seeing, this complete immersion in what you see—no longer needing to interpret, just looking.” AM: Who or what inspires you? VC: I’m inspired mostly by fine art, cinema, old photographs, and vintage oddities. AM: Digital or film? Why? camera as an extra light meter for my film cameras. I want to shoot film because the process of taking pictures with a film camera is more personal than with a digital camera. I’d say with a digital camera, you’re taking a photograph, whereas with film, you’re making a photograph. AM: Who is your favorite photographer, and how have you been influenced by his/her work? VC: I have so many favorite photographers, and I can never remember the complete list when people ask me! But as of right now, I really love Edouard Boubat. His compositions and subjects are so interesting and compelling. AM: What, in your opinion, is art? VC: Art is anything. I truly believe that. To have the courage to do what you wish most, to love another. Life is art. However, there is a difference between art and being an artist. Everyone can create art, but an artist has the ability to make others feel, to move them. AM: How does fashion play into your work? VC: I’m definitely inspired by fashion, but I try to blend both art and fashion photography together. I’m not sure what defines “fashion photography” these days. I think of it as being able to be creative with models and costumes and being able to make art without any set limitations while also having a marketable style, as silly as that sounds. AM: What mood do you love to capture in your work? Why? VC: Melancholic, wistful yearnings. Because that’s all I know how to do. AM: Do you prefer shoot on location or in the studio? How are the two different? VC: On location. I love shooting in nature and using different locations to tell stories. I’ve never shot in a studio, but I think they can be great as well. It’s like a blank canvas for you to play with. Nature is art. By shooting on location, you’re making art in art. ACHE Magazine: What do you try to convey through your work? Why do you photograph? I’m really interested. It goes well with my style. In fact, I’d love to take pictures only in analog. Gloria Marigo: I make photographs because photography is the art form that best suits me. We complement each other wonderfully, and I could never, ever do without it. Taking pictures makes me feel good about myself. What I try to convey through my work are my tastes, my feelings. AM: Who is your favorite photographer, and how have you been influenced by his/her work? AM: How long have you been shooting? How has your photography changed since you started? AM: What, in your opinion, is art? GM: I started taking pictures five years ago. Since I started, my photography has changed a lot in a positive way. I grew up, my tastes changed, and the pictures grew with me. I feel like they’re mine. To my initial creativity, I added the little cares and attentions that are only acquired with time and hard work. GM: My favorite photographer is Tim Walker. His pictures, his work, have prompted me to go ahead and create, create, create. GM: Art is all that is able to convey something to the viewer. AM: How does fashion play into your work? GM: During this period, fashion is playing a key role, and I’d like to specialize in the area. It always manages to join with my style. AM: How would you describe yourself as a person and as a photographer? AM: What mood do you love to capture in your work? Why? GM: Simple and ambitious, both as a photographer and as a person. GM: I am a melancholic person, and I like to reflect it in the photographs. Since I can’t be in that particular state of mind, I create it, transmit it, in the photograph. AM: Do you prefer shoot on location or in the studio? How are the two different? GM: I am a big fan of natural light and shooting outdoors. I haven’t had the chance to take photos in the studio, but I am thinking of trying. or makeup artist (which always makes things more fun! ), we do that before we go to the location and start shooting. AM: Do you prefer digital or film? Why? LL: Both have their advantages, but film is my favorite. Something about film feels more raw, beautiful, and real. I love film’s natural grain and how it’s been around for ages. Keep in mind, this is coming from someone who knows nothing about photography. I have a taste for it, but I am horrible behind the camera! AM: What do you hope to do with your modeling? What have you done so far? LL: For me, modeling is a creative outlet and a hobby. I am too short to pursue it professionally, and I enjoy taking on creative projects in which I have a say, rather than being paid to model for something that doesn’t fully engage me. So far, I’ve been in a few photography magazines, modeled for some local clothing stores, and done a few film projects. I graduated from the University of Texas in December with a B.S. in geology, and I plan to pursue a career in marine geophysics. AM: Finally, favorite spots to shop? LL: In Austin, my favorite place to shop is Dog and Pony and then Prototype. Thrift stores are always fun to look around, no matter where you are! For jeans and basics, I like Urban Outfitters and American Apparel, and for shoes, I like Solestruck. THOSE SUMMER DAYS she was lying by the pool, tugging at her knotted hair as she contemplated the heartache fresh in her paper veins. “there’s nothing like it,” she thought. “i’ve calculated the figures over and over. there’s nothing like it.” she saw him, either with her eyes or her mind’s eye, his blue jeans, white shirt, the way he carried himself and the whole world in his eyes, “but i’m too scared, and he wouldn’t like me anyhow.” he looked at her. she sat up and looked back at him, wondered a while, then laid herself down again. “it would hurt”—and though she thought that, she thought also of other things, the way he might sit her on his lap in the car on a hot summer day, the way he might sip the soup she’d made for a night in during a thunderstorm, the way he’d storm out of the house instead of hitting her—because she was crazy, and she’d hurt him so. the light reflected from the pool freckled her face. she closed her eyes. SEPARATION You are gone. I stand outside, beer in hand, fearing that if I go back in, you’ll come whistling by, and I’ll miss you. I miss you. The way you’d not know what was going on, the way you’d fall off your bike, call for me, watch me run to you—as if you’d planned it— and catch me in your eyes. Rinse and repeat. I’ve got that scar from when we collided on our bikes. I rub it every morning, as if the gray memory might summon its absent creator—but you are gone. Every kiss, bicycle crash, and shudder becomes a memory I can’t let go, a dead dream stitched into my lonely soul. I breathe you these days; I hate you for this. APOCALYPSE NO. 8 The world had ended a thousand times before, and always violently—until that summer. That summer, there were no stars exploding just miles above the atmosphere, no black holes or solar flares to rend the earth asunder, no moons to crash into Florence or Paris or Edinburgh. Mars and Sagittarius were still intact; all the other planets and constellations, too. The world just—stopped. Or slowed. The flowers exploded, and a kiss lasted centuries. Petals in the air. Armageddon was gentle that year. â&#x20AC;&#x153;Sweet Dreamsâ&#x20AC;? (mixed media on book cover) is about the dangerous complacency with our overly materialistic and consumptive culture. tyler varsell is a twenty-three-year-old artist in goshen, connecticut. she currently works full-time as a web designer. tyler’s work is inspired by vintage imagery, design elements, and themes of identity, eros, and dislocation. ACHE Magazine: What do you try to convey through your work? Tyler Varsell: I guess it changes with each individual work, but in general, I enjoy trying to give new meaning to random, ephemeral images—especially when they can reflect something more powerful about our culture or the human condition. AM: How long have you been creating art? TV: For as long as I can remember! I’m lucky that I come from a pretty artistic family, and creativity was always encouraged growing up. I was always drawing, making, designing... I think being an only child and having to occupy myself a lot of the time had an influence on that as well. I’ve been working in collage specifically since high school. AM: How would you describe yourself as a person and as an artist? TV: As a person, I guess I’d say I’m reserved, timid, introspective... and pretty insecure a lot of the time. I worry about everything! With my art, I enjoy the freedom of being able to express a vision and an idea. I’m much more confident and self-assured when I’m creating. AM: Who or what inspires you? TV: Everything... typography, strange images, colors, patterns, textures... I also try to constantly consume art online through blogs and social media. Nearly every day I come across a new artist who inspires me. AM: How did you get into collage and mixed media? TV: My high school art teacher introduced me to the art of altered books, which I thought was such a unique art form. I won a few Scholastic art awards for altered books I created and have been hooked ever since. I love to experiment with different surfaces and materials—there are so many possibilities with collage and mixed media. AM: Your work has a distinctive vintage touch. Could you explain how you were influenced and why yochose that aesthetic? TV: I’ve always been drawn to vintage things, especially photography. I think it’s interesting how most collage artists tend to choose vintage materials and images in their work; I just love the sense of nostalgia and obscurity that they evoke. AM: What have you achieved so far with your work, and what would you like to achieve? TV: I guess I’ve achieved some minimal recognition in the online art community through my blog (tylervarsell.tumblr.com), which has been a great way to share my work. I’m now represented by a gallery in Los Angeles and occasionally featured on a blog or in a magazine, which has been really exciting. I’ve only exhibited a couple times locally, so I’d love to get involved in showing my work more. I also just want to improve and continue to explore and take risks. With â&#x20AC;&#x153;Lungsâ&#x20AC;? (mixed media on book cover), I was inspired by how the airway tracts of a lung look like the branches of a tree, so I made this collage about the harmony of different life forms. “Good! Good! Good!” and “New” (mixed media on canvas) are a part of a “Slogans” series I began, in which I was inspired by the bold typography from vintage advertisements. I wanted to take the slogans out of the context of the advertisements and focus on the type itself, specifically its aesthetic quality and variance of word meanings. Each slogan is hand-embroidered. “Earth” and “Nucleus” (mixed media on canvas) are a part of a “Science” series about scientific curiosity and wonder and the aesthetic beauty found in science and nature. I wanted to keep the composition mostly the same, changing the colors, collage materials, and embroidered design. â&#x20AC;&#x153;Modern Romanceâ&#x20AC;? (paper and oil pastel) was meant to be a fun take on the influence of technology on young love. “Suburbia” (mixed media on canvas) is one of my favorites. I was inspired by aerial shots of suburban America, combined with a beautiful landscape and the cheeky image of a woman’s legs from a vintage pantyhose advertisement. I wanted the composition to be bold, but with a subtle attention to the details of the work. “The Great Society” (mixed media on canvas) deals with the turmoil of losing one’s true sense of being in our modern society of conformity, materialism, and sensationalism. â&#x20AC;&#x153;Unrequitedâ&#x20AC;? (mixed media on canvas) is a blunt representation of unrequited love and the idea of idealism versus realism. With “World Traveler” (mixed media on book cover), I was inspired by the texture of this particular book cover, combined with the image of a young girl’s dress and the colors and details from vintage maps. I love the simple composition and use of thread in this collage. CHABROS meet aggie chabros, our cover photographer. agnieszka is based in melbourne and has edgy, feminine work and a love for sweets and lace. YOUNG AND RESTLESS IN NYC ACHE presents a column by jacqueline harriet, jessie roth, and sandy honig, three talented young photographers who attend nyu. we bring you their experiences, thoughts, and pictures recording their lives. jacqueline Harriet It’s Monday afternoon, and I’m sitting in the quaint Soy Cafe in the West Village as I begin to compose this issue’s column recounting 2012. I’m sad to report that this new hangout of mine, Soy Cafe, is closing next week. It’s a disappointing reminder about New York City... so much is transient, and only the fittest survive. It teaches me to appreciate every moment, no matter how cliché it sounds. These last four months have been, by far, amongst the most exciting of my life, with each week’s events beating those from the week before. While school has certainly become more stressful, I’ve learned to balance my time between academics and exploring on the weekends. I’ve made some amazing friends this semester and strengthened bonds I made the last semester. When I flew back to NYC in late January, I was greeted with a fresh layer of snow on the ground. Sadly, the snow melted away within the next day, and my dreams of a frigid and realistic East Coast winter were shattered. I’m told next year I won’t be as lucky! One of the most memorable events this year was my experience taking streetstyle photographs at New York Fashion Week for my internship at StyleCaster.com. Only a year ago, I remember scouring street style blogs, admiring the inspiring faces of NYFW, and here I was photographing them this time around. For two full days I traveled back and forth between Lincoln Center and Chelsea, photographing the trendy folk attending the shows that showcase and inspire the fashion industry. At one point, I was photographing next to the great Bill Cunningham, the originator of streetstyle photography. Grace Coddington, fashion director of Vogue, and Nina Garcia, fashion director of Marie Claire, whisked past me. While waiting outside the DKNY show, I ran into Cara Delevigne, my favorite model, who allowed me to take a photograph of her. Many weekend adventures were had with my beloved crew of Flickr photographers, often meeting up at cafés, wandering around different parts of town, and ending the evening singing and dancing on Kenneth’s rooftop in the East Village. I’ve enjoyed getting to know my eclectic photographer friends, and I love how varied all of our artistic visions are. Instead of flying home for spring break, I decided to stay and explore the city. My mother flew in for the weekend, and her best friend Dennis took us to see Once on Broadway. Later that week, my best friend Jess flew in from Arizona, and I introduced her to all my friends and brought her to some of my favorite spots: Washington Square Park, Chelsea, Beacon’s Closet, The Crooked Tree, Central Park. After spring break, school certainly amped up, and the sun started to come out. Recently, most days after class, my friends and I have been lying on the grass in Washington Square Park, absorbing the rays. We also enjoyed a nice picnic in Central Park a few weeks back. It’s hard to accurately summarize all that has happened here in 2012, but I hope my photographs capture the varied experiences New York City has given me in my first year of college. It’ll be sad leaving a place I’ve come to call home and all of my valued friends, but I know time will fly by, and, before I know it, I’ll be back in the city with a fresh new perspective. 1. A subway vendor on the 1 line. 2. Streetstyle outside of the Jeremy Scott show. 3. My friend Eve amongst the lights at the Goth Rave. 4. A man walking home on a spring evening. 5. Tara spinning. 6. Cara Delevingne on her way to DKNY. 7. Streetstyle at the Lincoln Center. 8. Bill Cunningham in between shooting fashion show arrivals. 9. Eclectic decor of an Indian restaurant in the East Village. 10. Friends looking over the edge of Kennethâ&#x20AC;&#x2122;s infinity roof. 11. A rainy evening in Washington Square Park. 12. Group shot of friends after a picnic in Central Park. 1. The inside of the Guggenheim Museum. 2. A view across the water. 3. Sandy Honig in a picture on the beach. 4. Jacqueline Harriet under a flowered tree. 5. A friend in front of a MoMA display. 6. Friends with umbrellas on the beach. 7. An uprooted tree. 8. A MoMA installation of cellophane-wrapped candies. I took a trip to a Brooklyn beach with Tara, Kenneth Edwards, Metin Fejzula, Derek Murdock, Jackie Grossbard, Jessie Roth, and Jess Obert. I planned this trip after seeing a fellow classmateâ&#x20AC;&#x2122;s senior thesis project on this beach and its history as a dump. The shores are littered with objects, boats, and every color of glass. As an environmentalist, I observed this with dismay, but I rejoiced in natureâ&#x20AC;&#x2122;s reclamation of the site. As a photographer and collector (hoarder might be a better word), I was overwhelmed with the excitement of finding these treasures. There were typewriters, shoes, bottles, bricks, even boats, sunken deep in the sand. Sometimes getting out of the city is refreshing. I stayed at school for spring break, giving me the time to explore areas of Brooklyn. I took the train to Pratt to meet up with Tara Niami, Laurence PhilomĂ¨ne Olivier, and Arabelle Sicardi. After spending some time in Taraâ&#x20AC;&#x2122;s room, we went to Williamsburg to go thrifting and meet up with Logan. The weather was unbelievably warm, and the flowers were blooming. A few weeks later, I had the opportunity to work on a student film, both as a producer and on-set photographer. I had never worked on a film set before, and I really enjoyed both learning the technical terms used on set, the way a shoot runs, and the camaraderie that the crew forms. Now, things Iâ&#x20AC;&#x2122;m looking forward to: a semester-long project Iâ&#x20AC;&#x2122;ve poured my heart into, summer in the city, warm weather, a possible trip to Europe. martijn berk martijn berk is a photographer and filmmaker from amsterdam. he worked a few years as a project manager, and, during that period, he began to study photography. martijn loves to work internationally, experience new cultures, meet new people, and learn languages. in the last year, he began experimenting with short film. ACHE Magazine: What do you try to convey through your work? Why did you get into film? Martijn Berk: I started with photography, but after seeing some fashion-ish films that were published by SHOWstudio, I wanted to experiment in that. The great part of short films is that you have more control over the story you want to tell, you have the music, you decide on the order that people see your pictures, etc. Having said that, I think I will always make a combination of moving images (film) and still photography. AM: How long have you been shooting? How has your style or perspective changed since you started? MB: I’m shooting for about six years and a year or two on a professional level. Apart from getting technically better, I think my work is getting better and better, and it’s getting easier for me to tell the story I want to tell. But I am still searching and refining my style. AM: Who or what inspires you? MB: That can be almost anything. Of course, especially in the beginning, I looked a lot at the work of other photographers. But I can also be inspired by a feeling I have, or reading a book, or seeing a person on the streets. To give you an example, since I was a kid, I was very much interested in the last king of Bavaria (Germany), Ludwig II, and after recently seeing a play about him, I got the idea to do something on this theme. And the models I work with inspire me greatly, every model has something that appeals to me and that I long to capture. AM: What, in your opinion, is art? MB: Art is the creation of a new reality. AM: You often use models in your videos. How does fashion play into your work? MB: I don’t think I’m a “real” fashion photographer. I think fashion is more about a certain style you have instead of wearing the right brands or following trends, and I’m not at all fashionable. Normally I wear a pair of jeans and a white shirt. AM: You have work in photography and video. How are the two mediums different? MB: When making a film, you have more in control over the viewer, but the shooting, especially the editing, is much more difficult. When you take a picture, you know if it was a good shot, even if you work with traditional analog film. Filming is completely different. I only know during the editing if it’s going to be be good or not. AM: What are a few of your favorite films? Musicians? MB: I’m a big fan of French cinema—normally not the most cheerful films, but the acting is great. Some of the films I recently watched (and liked) are A Single Man, Death in Venice, Lost in Translation, Midnight in Paris, and César et Rosalie. magdalena LUTEK magdalena is a twenty-seven-year-old photographer in cracov, poland. she grew up in a beautiful rural area, surrounded by nature. sheâ&#x20AC;&#x2122;s always been a recluse, spending time alone and creating her own world. AM: What have you achieved so far in your photography, and what would you like to achieve? Magdalena Lutek: I’m interested in portraying dreams, mystery, anxiety, loneliness, and silence. I’m fascinated by the concept of the anonymous portrait, trying to convey a person’s character and soul in an unconventional way. I often hear that my works are strange and unusual, and I take that as a compliment. Why do I photograph? It’s my way of expressing myself, it’s a need and a strong desire to create. ML: I’m very grateful to have a couple of my photos featured on book covers. Through photography, I was able to meet wonderful people that I’d never have met otherwise. I’d love to continue the journey and be able to travel to take photos all over the world. ML: Pensive, melancholic mood because I know it so well. ML: I started taking photos when I was fifteen. That summer, I found my dad’s old camera in the attic and shot my first roll of black-and-white film. I instantly fell in love. My technical skills have improved, but I still look at the world with the same eyes. AM: Where do you like to shoot most, and why? AM: How would you describe yourself as a person and as a photographer? ML: I wouldn’t distinguish between the two. People have described me as introverted, shy, a recluse. I’m an observer and a listener. I’d say my works mirror my way of being. AM: Who or what inspires you? ML: Nature, memories, melancholia, sadness, and loneliness. AM: Why do you use film? ML: Film has an indescribable quality that can’t be replicated, and it will always have a special place in my heart. AM: Who is your favorite photographer, and how have you been influenced by his/her work? ML: Some photographers I admire are Emil Schildt, Francesca Woodman, Sally Mann, Paolo Roversi, Tim Walker. I grew up looking at their works (and works of other great photographers), and they taught me about the beauty of light and shadow, about following my own instincts and vision to grow as an artist. ML: I love the intimacy of my own room and forests, surrounded by beautiful nature. AM: Favorite books, movies, and bands/singers, and explain why you love them! ML: My favorite books are Solaris, The Star Diaries, and Return from the Stars by Stanislaw Lem, Kurt Vonnegut’s Cat’s Cradle, and The Time Machine by H.G. Wells. As for movies, 2001: A Space Odyssey; Zelig; Sabrina; Roman Holiday; My Fair Lady; Truman Show; The Fountain; Scott Pilgrim vs. The World; The New World. I love science fiction—the mechanized, idealized future with the human trapped in the new world unchanged, still torn by the same emotions and desires, still imperfect. I also have a soft spot for classic love stories such as the aforementioned Audrey Hepburn movies. Other human conditions that move me deeply in movies and prose are impossible love, souls that only meet for a short time to be parted forever, unrequited love. Recently I’ve been listening a lot to Bon Iver, Sufjan Stevens, Iron and Wine. I also like Death Cab for Cutie, Sigur Rós, Múm, Hammock, Gregor Samsa, Seabear, Warpaint. issue #7 of ACHE magazine, a quarterly magazine created by and for young people around the world. released on january 30, 2013.